Cathay Pacific earlier today announced that it had reached agreement to buy full control of Hong Kong Express from debt-strapped Chinese conglomerate HNA Group for 4.93 billion Hong Kong dollars ($628.12 million). The purchase will be made in cash and through promissory loan notes, the company said in a stock filing. Hong Kong Express, which flies 24 airbus A320 airplanes to destinations across Asia, will become a wholly-owned subsidiary of Cathay Pacific. The good news is that the HK express fleet is compatible with the Cathay Dragon airbus fleet. The bad news is that the Cathay Dragon and HK Express networks are broadly similar. Cathay Dragon has greater reach into China and HK Express a stronger Japanese network. 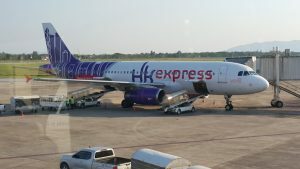 “We intend to continue to operate Hong Kong Express as a stand-alone airline using the low-cost carrier business model,” a Cathay Pacific spokesperson said in a statement. What the deal does do is reinforce the company’s dominance over Asia’s busiest international air hub as it completes a big expansion of capacity including the addition of a third runway. One other thought – the fact that this deal helps bail out cash strapped HNA must earn Cathay a few reward points with the authorities in Beijing. Another reasonable conclusion is that the deal is not good for Hong Kong’s consumers and will allow Cathay to push up fares in its new LCC subsidiary. Investors have not embraced the deal, pushing Cathay shares down 2.1% to HK$13.40 in morning trading on Wednesday. Some investment analysts questioned the price Cathay is paying. Both Morgan Stanley’s Xu and Kelvin Lau of Daiwa noted that Cathay is paying about 4.5 times the book value of Hong Kong Express’ net asset value of HK$1.12 billion. By comparison, Cathay’s stock trades at 0.84 times book value, according to Refinitiv data. In Cathay’s announcement, it disclosed that Hong Kong Express had posted a net loss of HK$141 million last year after earning a HK$60 million profit in 2017. Tony Fernandes, chief executive of AirAsia, the region’s largest budget airline company, said he had passed on buying the carrier himself and predicted Cathay would have trouble effectively integrating Hong Kong Express into its group given varying priorities and needs. That should be taken with a pinch of salt. Although Cathay said it aimed to close the acquisition by year-end, it disclosed that an unnamed shareholder of a holding company for Hong Kong Express has indicated it will make a legal challenge to the buyout agreement. The sale of Hong Kong Express marks the latest in a long series of disposals for HNA Group. The Hong Kong government this month directed Hong Kong Airlines, a full-service carrier also controlled by HNA, to submit a financial improvement plan as a condition of keeping its operating license.